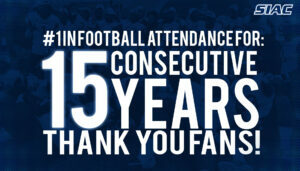 ATLANTA (March 29, 2018) – For the 15th consecutive year, the Southern Intercollegiate Athletic Conference (SIAC) led all NCAA Division II conferences in football attendance the conference office announced on Wednesday. Last season, SIAC football games drew an average of 7,117 fans per game with total attendance of 341,607. In Division II, attendance reached over 2.9 million across the 909 games with average of 3,273 per game. Being the only Division II team with a three-game home stance, Tuskegee dominated Division II in football home attendance after coming in second place last year. Tuskegee’s Cleve Abbott Memorial Stadium drew an average attendance of 14,998 fans after drawing only 10,130 fans in the previous year. Morehouse (10,100), Fort Valley State (9,572), Clark Atlanta (7,237), and Miles (6,469) rounded out the Top 15. In 2017, the SIAC drew 341,607 fans throughout 48 games while averaging 7,117 fans per game. The SIAC has led all NCAA Division II conferences in football attendance for 26 of the last 28 seasons dating back to the 1990 season. 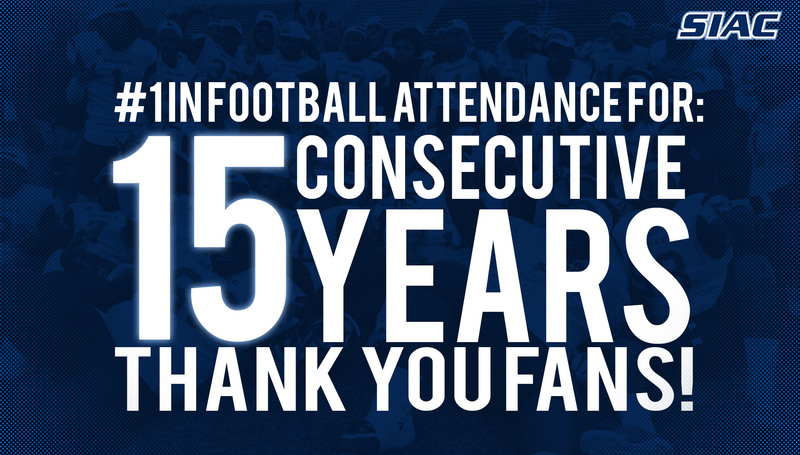 Since 1990, the SIAC has led NCAA Division II football attendance 25 times including totaling an attendance of at least 300,000 on 20 occasions. Among the most well attended games last season were the 82nd Annual Tuskegee-Morehouse Classic (25,101), Miles versus Tuskegee (17,350), and the Fountain City Classic (13,391). The SIAC is a NCAA athletic conference consisting primarily of historically black colleges and universities with headquarters in downtown Atlanta, Georgia. The SIAC includes 14 member institutions (Albany State University, Benedict College, Central State University, Claflin University, Clark Atlanta University, Fort Valley State University, Kentucky State University, Lane College, LeMoyne-Owen College, Miles College, Morehouse College, Paine College, Spring Hill College, and Tuskegee University) which are located within a contiguous six-state footprint (Alabama, Georgia, Kentucky, South Carolina, Tennessee and Ohio). The SIAC sponsors seven men’s and six women’s sports and is a proud member of the NCAA Division II. I am a senior, Mass Media Arts major with a concentration in Radio, Television, and Film at Clark Atlanta University in Atlanta, GA. I plan to pursue a graduate degree following my undergraduate experience where I am interested in studying Sports Management. I am also exploring the field of communications in order to fuse my passion for creativity with my undying love for sports. I stay involved on-campus as I maintain being a full time Division II student-athlete with being active in organizations and activities such as Student-Athlete Advisory Committee, Delta Sigma Theta Sorority, Inc., "The Panther" Student Newspaper, etc. Career interests are in fields such as sports management, broadcast journalism, public relations, and strategic communications.